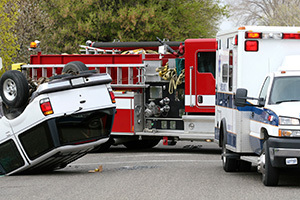 Rollover accidents are incredibly dangerous, and the injuries that result from them can be severe. Tragically, many of these injuries are ultimately preventable, because these accidents are often caused or exacerbated by design or construction flaws. The victims of these accidents may be entitled to seek financial compensation for lost wages, medical bills, and pain and suffering. If you or someone you love has been injured in a rollover accident, the SUV rollover injury attorneys of the Willis Law Firm may be able to help you. Our law firm is dedicated to fighting to protect the rights of clients who have been gravely injured because of vehicular flaws. To discuss your case with one of one of our experienced and compassionate attorneys, please contact us today by calling 800-883-9858. According to statistics, SUVs are 27% more likely than other passenger vehicles to roll over in an accident, and over 60% of the fatalities which occur in SUV accidents are caused by rollover accidents. Even more worryingly, approximately 25% of all automobile-accident deaths are caused by rollovers. If you have been injured as the result of a rollover accident, you and your family should not have to worry how you will pay for the medical bills and cope with lost wages. Discussing your case with an experienced SUV rollover attorney may be the first step to ensuring that justice has been done. The SUV rollover accident attorneys of the Willis Law Firm are dedicated to getting our clients the compensation and the justice they deserve for their injuries. We have a wealth of experience handling virtually every type of rollover accident, and we may be able to use this to secure you the money you and your family need. To discuss your case with us in detail, please contact us today by calling 800-883-9858.